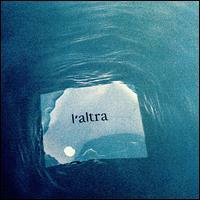 This new album, by L'altra, represents a real mixture of styles including jazz, electronica, indie rock, and lots more. There are a few guest appearances on this, as well. Fred Lonberg-Holm, who has been parts of many projects and bands including PEEP and Pillow, brings cello into the mixture. As well, Rob Mazurek (of Isotope 217) helps out on some of the more jazzy pieces, adding some really nice cornet playing to top this all off. The pieces themselves are very nice. There are some amazing stand-out tracks, but this cd, in general, is a really good release. For example, songs like "room becomes thick" and "motorme" are excellent, unforgettable songs. Many of the pieces here are reminscent of Low and Sigur Ros, as they are solemn and dark, and they have that strange "churchy" ambience. Further beauty comes in the later half of the cd, as well, so don't be afraid of the dreaded "filler" that invades some albums. This whole cd is really nice. Mmm mmm good.